Wisa Punyanitya is the legislative and regulatory analyst in BGA’s office in Bangkok, Thailand. In this role, she specializes in analyzing Thai government public policy across a range of sectors and clients. 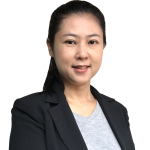 Prior to joining BGA, Wisa practiced law in Thailand since 2000 with leading law firms such as KPMG and White & Case. She provided legal and tax advice to many public and multinational companies in such fields as corporate law, mergers and acquisitions, real estate, foreign investment, investment promotion, labor, and dispute settlement. Wisa earlier served as a special lecturer in the Faculty of Humanities and Social Sciences at Suansunandha Rajabhat University where she specialized in legislative research, foreign investment policy and business issues. Wisa holds a Master of Laws degree from Southern Methodist University School of Law in Texas and a Bachelor of Laws degree from Thammasat University School of Law in Bangkok.